McCandless Township is a growing community, due in part to the McCandless Crossing shopping and residential area located off of McKnight Road. McCandless Crossing is home to Trader Joe’s, Riverstone Books, Cinemark Theater, and a number of restaurants. It also has an outdoor space that’s used for concerts in the summer. The township’s neighborhoods are given an A+ in the categories of “Good for Families” and “Public Schools” by niche.com, which also gives it As in “Housing” and “Jobs.” The township proudly includes a statement of equality, diversity, and inclusivity on the front page of its website, welcoming people to live in, shop in, and visit the community of 29,000 people. We love the township’s tree-lined streets, large yards, and sense of community. Some sought-after neighborhoods have community pools that bring entire neighborhoods together for the summer. The community’s school district is North Allegheny, consistently ranked one of the highest in the nation. Being north of the city, McCandless is a great place for commuters who can avoid tunnels and use I-279’s HOV lane for a painless morning and afternoon drive to and from work. 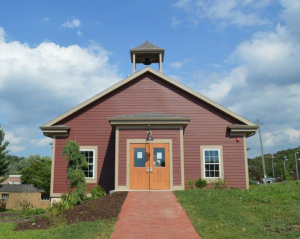 The McCandless-Northern Allegheny Heritage Center, a new addition to the community, is a building reminiscent of an old school house—located beside the township’s municipal offices and soccer fields. The center is a meeting place for groups and hosts special events throughout the year. Just ¼ mile away from the center is North Park, the largest of Allegheny County’s parks. North Park’s boathouse offers opportunities to get onto the lake in kayaks, canoes, paddleboats, and stand-up paddleboards. There’s a designated bike and walking trail along the lake as well as miles of wooded trails to explore. McCandless Township is also making efforts to become a “greener” community through its tree planting program and through the installation of a large rain garden at the Heritage Center. The rain garden collects storm water runoff from the center’s parking lot, lessening the amount of water that drains into Pine Creek. The gardens were installed in partnership with Audubon Society of Western Pennsylvania and feature plants native to the area. Want to know more about McCandless? Contact us and we’ll let you know about homes available in this family-friendly community.